Gorgeous 3BD House, 250 feet away from the beach! 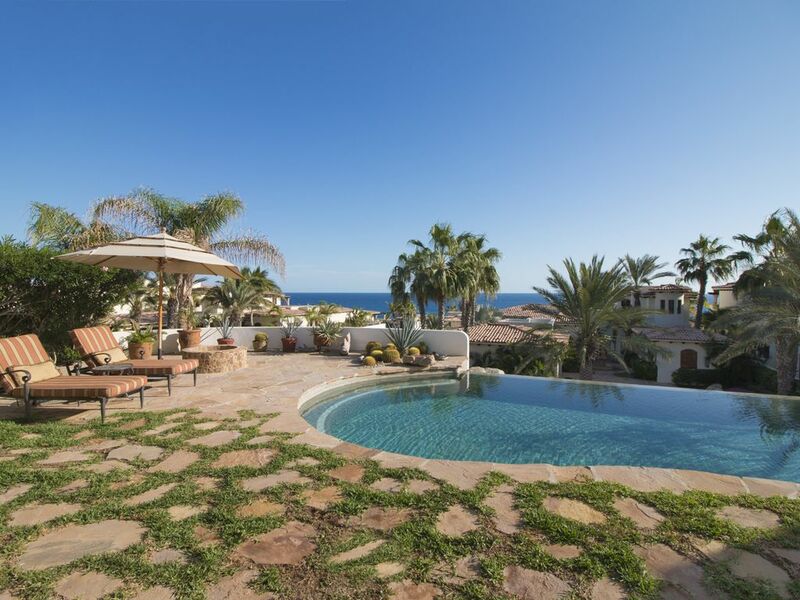 This is a 7 year old home maintained primarily as a large, 3600 square foot, private luxury home less than 2 miles down the beach from San Jose del Cabo's resort hotel area and new marina in Los Cabos. Located in a gated community, the property features antique reproductions and oriental carpets inside, with magnificent views of the bay between Punta Palmilla and Punta Gorda, where this year 1400 whales were reported to have spent the winter. From the private pool, spa, patio, and palapa the view to the beach is only 200 yards and encompasses a 180 degree view of The Sea of Cortez. Magnificent! The beach is still unspoiled, empty, with the near shore waters having traditionally been an oystering and lobstering area. Surfing is a popular sport along the beaches of Los Cabos in the summer as well as world class fishing in large sportfishing boats or local smaller 'pangas'. Restaurants abound and increase in number each year in the San Jose and Cabo San Lucas areas. The restaurant quality is world class, although the kitchen of the house is fully equipped with outstanding, carefully selected table linens and flatware and cooking tools as well as is the palapa/bar/grill area. The house is cared for by a housekeeper who can be present five days a week for a nominal amount and will also prepare lunch if requested. Special arrangements for a chef or restaurant reservations, or any other activities can be arranged through the concierge service on site. A week's stay at this property can be the experience of a lifetime. To view 360 degree pictorials of the development, go to the 'elencantoloscabos.net' website. You will be enchanted! El Encanto Villas provides luxury vacational rental services for the exclusive community of El Encanto de La Laguna. El Encanto Villas is dedicated to making your experience at El Encanto unforgettable. The community is absolutely beautiful and we pride ourselves on the product and the services that we are able to provide our clientele. From personal chefs, in home spa services, grocery stocking, to outdoor activities, we can assist in making your rental experience unforgettable. The community is like no other in Los Cabos, off the beaten path in a quiet and private setting surrounded by pristine Baja desert and the Sea of Cortez. This is a natural playground and we can help you find many ways to enjoy it. The community of El Encanto is located only 3 miles from the new Puerto los Cabos Marina in San Jose del Cabo, 7 miles from downtown San Jose del Cabo, only 15 miles from the Los Cabos International Airport, and 27 miles to downtown Cabo San Lucas. The community of El Encanto de la Laguna is a boutique, beachfront, quiet community in a secluded area for your perfect getaway, El Encanto de la Laguna is for those that really want to get away, relax, let their worries melt away with the beautiful scenery and simply enjoy. The transportation options to get to El Encanto are renting a car, taxi or private transportation. We help our guests with the different options available and getting the best prices. If you plan to visit town frequently, renting a car is highly recomended, as is cheaper than taxis and private transportation. The friendly service team on site is there for you to discuss the many options available for adventure or relaxation in the area or arrange restaurant reservations, cleaning, car rentals, grocery shopping, personal chef, in home spa and much more. Free Concierge Services to help you book rental car, amazing activities, chef, massages, and just anything to make the perfect and worry-free trip you deserve. We also rent cribs and highchairs for your chldren. We like to greet our guests and let them know our office hours and just the generals about how to enjoy our piece of paradise. We are on site and we are always available for our guests needs. this kitchen is fully equipped as a home, not just a rental. Gym on site in El Encanto de la Laguna available for no extra cost. Concierge services available for no extra cost Free Concierge Services to help you book rental car, amazing activities, chef, massages, and just anything to make the perfect and worry-free trip you deserve. We stayed 2 weeks at Casa Jardin, with 2 daughters and their families. We loved the house, having a pool, BBQ, hot tub, and beautifully decorated, well equipped house, made it easy to enjoy our vacation. Olivia was very appreciated as we haven't had "refresh" service in other places we have stayed. Our Chef night was great food and a lot of fun. It was better than going to a restaurant especially with small children already in bed. The only thing we missed having were beach chairs. We would deffinatly enjoy staying here again . Thankyou Maria, Alilat and Susana , for all the help with the groceries , the prestock and the mid week. We will be back ! Thank you very much for your nice comments Jo. It was a pleasure having you here. We are glad to hear that you enjoyed your stay! See you next time! El Encanto Villas Team. This villa was an amazing home to my girlfriend and I as we spent a week relaxing in Cabo. Right when we walked in the door, we were blown away by how gorgeous everything was. The home has first class amenities and decorations, making us feel like a modern day king and queen. The beach, which was COMPLETELY empty, was a quick 2 minute walk from our front door, making for some lovely afternoon strolls. The house is also conveniently located near several spectacular golf courses as well as Flora Farms, which is one of the best restaurants in all of Cabo. On top of that, the staff of the community (El Encanto De La Laguna) is extremely nice and helpful. Sujey (the women responsible for taking care of the house/guest needs) went out of her way to make us feel comfortable and answer any questions we had (i.e. how do we use the stereo system, when does the gym open, where are good places to eat, etc.). My girlfriend and I can't wait to return, it was one of the best vacations we've ever been on. My newly married husband and I stayed at this beautiful home for our Honeymoon. We were unsure of what to expect, but as soon as we arrived it was more than we ever would have expected. The house is absolutely beautiful, the pictures on here do it no justice of the actual beauty. Not only was the house amazing, but the view was like a post card. When arriving at El Encanto De Laguna we had no plans made, the staff at the housing area, Sujey, took the time to sit down with us and make all of our dinner reservations at places highly recommended, and also booked our Ziplining trip (Cabo Adventures), and fishing trip for us. The restaurants we visited while in Cabo San Jose/ San Lucas were La Panga Antigua (San Jose), Bar Esquina (San Lucas), Sunset Mona Lisa (San Lucas), Habaneros (San Jose), Alcaravea (San Lucas), Floras Farms (San Jose), and 7 seas (San Jose). Every single one of these restaurants were delicious, and the service was wonderful. The only restaurant we didn't care for the food was Sunset Mona Lisa, the portion sizes were very small, however the view was incredible. Ps. Watch out for the cows on the roads in San Jose at night time. Just got back from a much needed break down in Cabo with my wife and 3 other couples. WOW !!! The house was even more beautiful and luxurious than we expected from the photos and reviews. We did it all, golf, surf, snorkel, massages at the house and lots of relaxing in the lovely pool. I would highly recommend this house to anyone who wants a first class place to stay and even though we didn't have our kids this time, I think that it would perfect for our 9 and 11 year old daughters as well! Want to mention a really great restaurant we discovered only 10 min away, Flora's Farm is simply a must do on any trip to the area. It is so nice to find really fresh and amazing food that matches the first class accommodations of the house. This house and the surrounding area is like no part of Mexico that I have ever seen...first class in every manor, thanks!!! This is a fantastic villa and a wonderful place to relax and unwind. It is a beautiful, three-bedroom hacienda in a secure, gated community. The house is very large and the bedrooms are separated such that you have complete privacy, including a large “en suite” bathroom in each bedroom. Two of the bedrooms have King size beds, while the third has 2 Queen size beds plus 2 bunk beds. This makes it a perfect place for 3 couples or 2 couples with a separate room for the children. It includes a fully equipped gourmet kitchen, so you can prepare your own meals (or have the housekeeper cook for you). You can also walk to the local café, Buzzard’s. Buzzard’s is a small old style out-door Mexican café (palapa roof and sand floor) with excellent margaritas and meals. The house and the community are very quiet, so it is enjoyable to stay around the house and enjoy the fabulous views, read and/or play in the heated infinity pool and Jacuzzi. We also saw whales from the outside seating area almost every morning. The house is just a short walk from a beautiful beach, which had no one on it when we were there in late January. In fact, we saw very few tourists in the area on any of our daily walks. Best Vacation Ever ! Husband regains his youth , wife relaxes and even the kids are happy . This place is total luxury with all the amenities and more all wrapped up in the setting of the beautiful Mexican Baja coast. Very safe- guarded entrance with an escape into your own private paradise. Imagine being able to jump into your own private infinity pool and swim up to the pool bar to grab a cold cervessa then hang out in the adjacent hot tub with your favorite music playing watching pods of whales go by ! One short block to an empty beach for your play or if you prefer an on site work out room . Super nice staff stay out of your way but somehow manage to do laundry, clean the pool or help you with reservations to a nearby top rate ocean view golf course which comes complete with complimentary plentiful drinks ( free booze) and fairway sided free delicious fresh made tapas and tacos. large grocery store which carries most every item you would find at home plus cheap warm hand made tortillas , churos and other Inexpensive but great local items such as huge perfect mangos. Since the kitchen is fully equipped and there's plenty of dining room places both inside and on the covered porch there's no need to get out of your swim suit . However when we occasionally venture out there are tons of great restaurants in nearby San Jose del Cabo and will as fun shopping areas with local crafts , clothes , arts etc.The Mexican people are very friendly and you don't have to speak Spanish although . We always feel safe . The owner helped us with lots of tips on such things as great beachs for snorkeling , surf and fishing spots and many places to dine both casual and more upscale. San José del Cabo it’s a beautiful and charming town located just 7 miles from El Encanto de la Laguna, with many good restaurants, shops and world class galleries. The Marina in San Jose del Cabo is open with a beautiful design and construction. Its full operation unfolds as more boats utilize the facility for activities like sportfishing, whale watching or simply cruising the sparkling sea. Beginning just north of San José where El Encanto de la Laguna is located, the East Cape stretches nearly a hundred miles along the Sea of Cortés eastward and northward past Los Barriles. This beautiful stretch of desert coastline is still mostly undeveloped, however the towns of Los Barriles and Buena Vista are thriving fishing and tourist communities offering lodging and local cuisine.The East Cape is also the windsurfing center of Los Cabos, as well as being home to the more remote Cabo Pulmo which draws divers to the most northerly coral reef in the Pacific.